Alison Chambers and family went north last month for The Fringe. Up on Little Red and back on BA. And through the airport onto the tram. All very good. 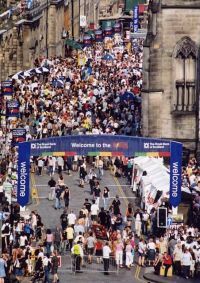 It is said that by the time the last promotional flyer from the Edinburgh Fringe Festival (1-25 August) is removed from the Royal Mile, the world’s largest arts festival is ready to roll around again. Established as part of the Edinburgh International Festival in 1947 in a post war event effort to provide a ‘platform for the flowering of the human spirit,’ the month of August transforms the usually quiet and sedate Royal Mile into a sea of vibrant colour, absurd costumes, juggling chain saw acts and singers from all over the world – the US, Japan, Samoa, all bringing their own special cultures to the Old Town. 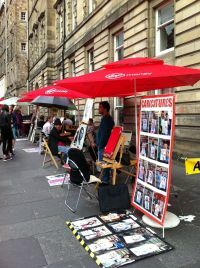 The Edinburgh Fringe is a terrific boost to the tourism industry with hotels, apartments and b&bs, even camping sites sold out months in advance. Restaurants, bars and pubs benefit too as do the scheduled airlines serving Edinburgh and Glasgow. Popular eateries including Deakin’s House Café, a charming teashop with amazing cakes and scones, The Edinburgh Larder and Angels and Bagpipes, all enjoyed brisk business. The Fringe is new to my summer calendar with a newly graduated professional actor in the family performing there. With the ballot on independence in firm focus plenty of the Fringe shows seized the opportunity to highlight Scottish identify – a must almost for satirists, comedians and playwrights to add it to their scripts. One show ‘Spoiling’ takes a look at Scotland shortly after a Yes vote has been returned. John McCann’s work at the Traverse Theatre shows a Scottish foreign secretary gearing up to give a speech on the state of the settlement talks. The Occupied, new comedy this year, featuring a group of actors hijacking their theatre, peppered their show with a number of clever ditty songs about the Referendum – Do we stay or do we go? Another popular reviewed show was Alan Bissett’s The Pure, the Dead and the Brilliant, a satire on the No campaign with the demons of Scots folklore being involved in the big debate. Meanwhile, Back to Bowie’s, picked up on the popular artist’s call at a music awards ceremony to keep the UK together, bringing together different guests each night to discuss referendum themed politics, poetry and pop music. There was no shortage of new material – which is what the Fringe is all about. Being in the heart of Edinburgh during Festival season was a bit like being in New York during the Super Bowl with the sheer volume of people on the streets. Standout highlights for us were a trio of comedy actors The Sleeping Trees for laugh out loud funniness, The Canterbury Tales, from Oxford’s The Close up Theatre Group, marking its 10th year at the Fringe with its adaption of Chaucer’s bawdy tales of the 14th century pilgrims and Out of the Blue, a well-known A Cappella group from Oxford who packed out the George Square Theatre for three weeks. The Blazers was the show we had come to see, a comedy play from Oxfordshire writer Chris Tolley directing three newly qualified actors from Drama Studio London. There is massive competition to get visitors to come and see the new shows so performers rely largely on what is real camaraderie on the Mile, friends recommending friends to see their shows. Social media recommendations play a big part too, especially Twitter and positive mentions in The Scotsman and Sunday Mail reviews are priceless. The Blazers achieved that. This is the Festival that launched comedian John Bishop. He was playing to a handful of people in 2007 and now he fills the O2. Before him, Emma Thompson, Stephen Fry and Hugh Laurie, straight out of Cambridge Footlights. We stayed at Roxburgh Court, a modern block of apartments in the old town, walking distance from The Royal Mile and a short taxi ride to the main Waverley Rail Station, extremely well appointed with wi-fi, modern kitchen, flat screen tvs and large bathroom. 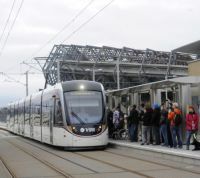 The best way into the city is by the highly efficient tram which runs directly from the station, very clean and fast. We relaxed so much and enjoyed the shows and the atmosphere over a long weekend that we forgot our departure time back, missed our Little Red flight home and flew back with British Airways to Heathrow. BA also serves Edinburgh from London City and Gatwick. Bookings are already being taken for next year. Get in quick.